You've decided to give GigMasters a try and sign up for our Lite Membership. So now what? It's time to put the finishing touches on your Lite Membership and set your business up for success! Understanding the importance of a complete, well-rounded GigMaster’s profile is a key component to success. Here are 3 things you should do, as soon as possible! Category selection is arguably the most important feature to understand! The type of traffic your profile receives is directly correlated with the categories you choose. With the Lite Membership, you can choose two categories, so it is especially important for you to choose appropriately. Client’s use general keywords to locate vendors and entertainers, put yourself in their shoes when choosing your categories. General categories like “Cover Band” and “Acoustic Guitarist” will ensure maximum exposure and get more clients viewing your profile. The secondary category can be a tad more specific, to showcase specialties. You may be brand new to GigMasters, but that doesn’t mean you’re brand new to the event world. Potential clients will look to your Profile Description to gain an understanding of your specific skill set and how long you have been offering services. 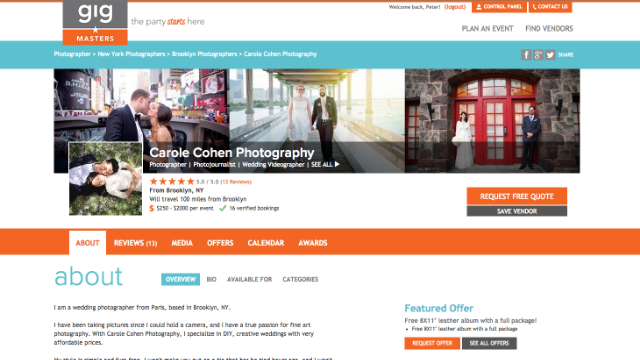 Simply give the client an idea of what they're going to when booking you. Be sure to articulate your strengths and mention reputable clientele (with their permission, of course)! Remember, this is your opportunity to sell yourself! Highlighting career achievements and awards is strongly encouraged! Uploading a sleek, eye-catching cover photo and clear photographs are necessary additions in order to verify previous professional experience. If you have additional questions about the process, Tips & Tricks to Uploading Media is a great read! Your Lite Membership offers a customizable profile which includes space for Audio and Video samples. Members with video samples are actually 40% more likely to get booked than those who do not. We recommend understanding and implementing these recommendations in order to ensure success with your Lite Membership. If you would like access to additional features and even more exposure, please keep in mind that upgrading is always an option at any time during your 3 Month Trial Membership!